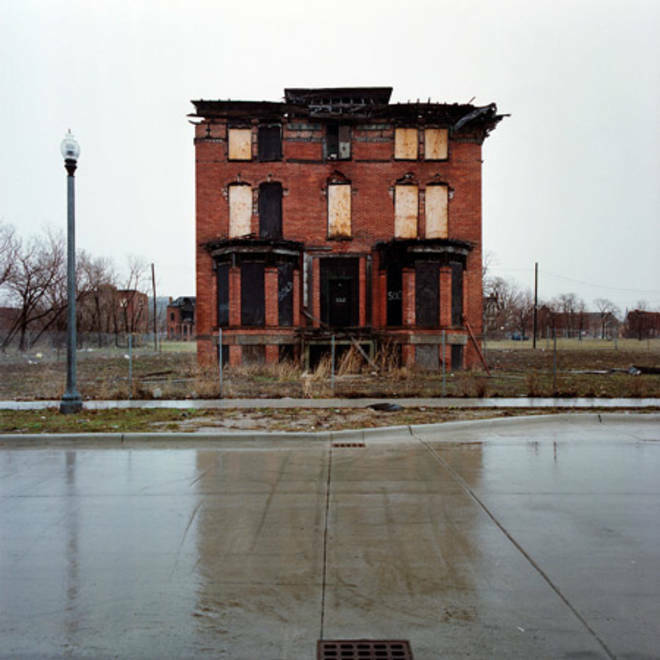 An image from the series of "100 Abandoned Houses" in Detroit. The housing bust has been a boom for some photographers and other artists looking to document the rising number of abandoned homes in urban centers and elsewhere across the nation. Photographer Kevin Bauman of Detroit has created a particularly stark and beautiful collection of images from that shattered city, collected on his website under the title "100 Abandoned Houses," although he has by now collected well over 100. The houses are shot straight on and centered in a square frame, often set against a flat, gray sky. Bauman says he has been photographing abandoned homes in the Detroit area for over a decade when he is not busy with commercial work. Bauman sells his photos in a limited-edition prints for $100 to $500, depending on the size and print number. Bauman is not alone in his obsession. Another Detroit photographer, James D. Griffioen, documents urban decay including haunting "feral houses" that are overgrown with ivy and weeds. David Schalliol makes images of abandoned homes and commercial buildings in his series on "isolated buildings," which he says is aimed at "revealing meaning through recontextualization." Remember that for the test. Thanks to Business Insider for pointing out Bauman's work. Know of any other art projects that make use of abandoned homes? Tell us about it the comments section.